Not much progress on the modules since coming back from Hong Kong, but I decided it was time for a real turnout of my storage boxes of trains, dating back nearly 50 years. It’s time to keep a few things, and dispose of a lot more! And of course, this job is full of surprises. If you want three brand new Lima ‘O’ gauge Class 33’s in blue, please contact me – you can have them for a very, very keen price. What on earth was I going to build when I acquired those models? Perhaps it was when we first moved to Redhill in 1986, and there was plenty of trainspotting to do at Redhill station, with plenty of loco hauled goods (and even a few passenger) trains. I was thinking of ‘O’ gauge modern image (for modern image read 25 years ago). Digging deeper into this particular gloat box, I came across a real surprise. First, a rake of OON3 Irish wagons and coaches. A few kits but mostly scratch built. I recall (just) that I built most of the wagons during a couple of months in a rather poor hotel room in Semarang, Java, in 1990. I think the coach, brake van and horse box were built a little earlier. I had always wanted a model of the two Trailee & Dingle coaches since a plan appeared under the title of ‘Narrow Gauge Wanderers’ in a copy of the Model Railway News, sometime in the 1960’s. When I got found to the model, it used the approach written up by David Jenkinson, with clip on ends and removable glazing. I have to say, this model is probably as good as anything I’ve done since. 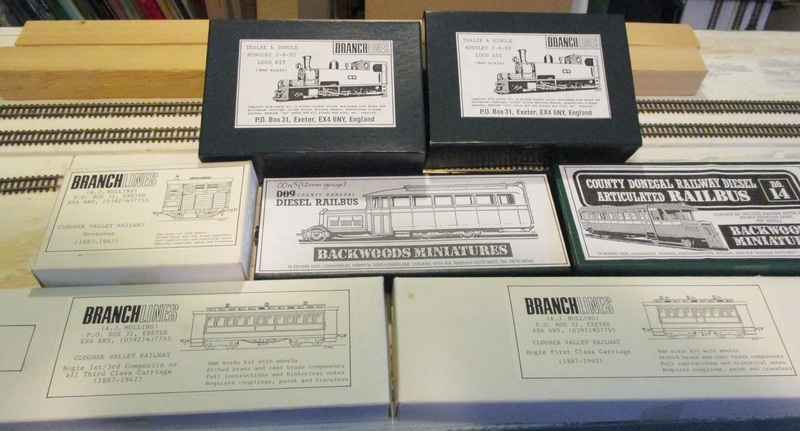 But digging into the box, there seems to be more – enough loco and railcar and coach kits for a complete OON3 layout! All that lovely etched brass is crying out for a soldering iron. Perhaps a diversion into narrow gauge is called for. And this is only the start. I’ll post some more pictures of my early modelling attempts over the next few weeks. I am going to scrap some of these models, as they hold only limited sentimental value, but a few pictures will make a permanent record. This entry was posted in Inspiration, Jon's layout ramblings, Weird and wonderful and tagged irish railways, model railway, narrow gauge. Bookmark the permalink. 1. Do you still have the Tralee and Dingle locos and/or the Backwoods kits and 2. might you be willing to sell them on IF you don’t want them? Couple of reasons I ask. Firstly, Earlier this year I built a couple of Clogher Valley coaches for the Kerry Model Railway Society’s model of Dingle. We (at Chester MRC) have given them our model of Dingle Station for display at their exhibition at the windmill in Blennerville just outside Tralee and they could do with a longer train than two coaches and a horse box! Secondly, I would be interested in any of the other kits if they were still around. I could guarantee they would see active service on our model of Castlefin. See http://www.chestermodelrailwayclub.com/narrow_gauge.htm for what we have achieved so far. I apologise if this seems cheeky but there must be a lot of Backwoods kits out there unbuilt which seems a waste! All the best with your endeavours. Not cheeky at all! But I’d rather hang onto the models for now. I do enjoy building kits and there is every chance – even after all these years – that I’ll give them a go in due course.